As I look out my window to a marshmallow world of snowdrifts that are over my head, I shake my head at the theme of this blog post. But I know some of you out there in the Northern hemisphere are already experience thawing, and the season it brings — Mud Season. As much as I have always loved the warmer temperatures of the thaw after a long winter, the mud is something I could really live without. Especially when lots of little muddy boots come tramping inside after a glorious outdoor playtime. 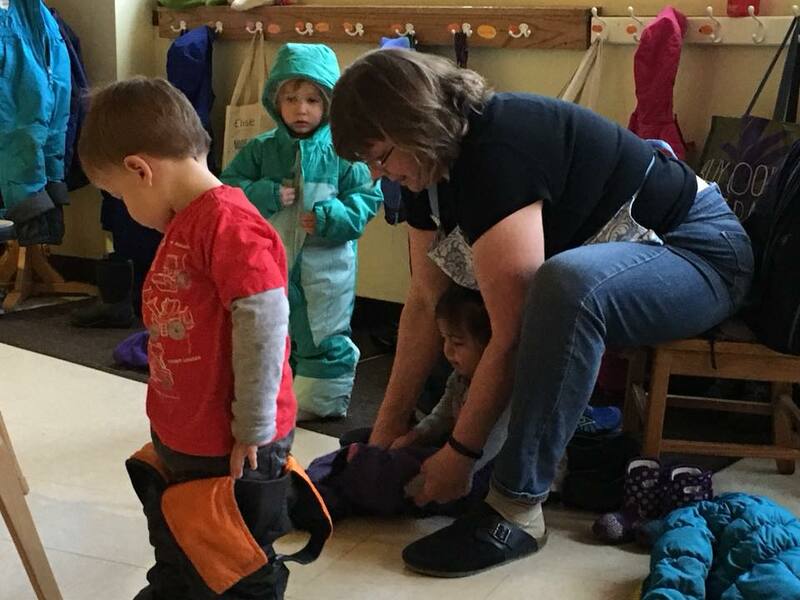 The late winter thawing time can be a challenge for early childhood teachers and caregivers, not just because of the mess, but also because children often arrive at our programs without enough or the right kind of gear to play outdoors in cold, wet conditions. It can be frustrating. So, today we celebrate The Thaw, and it’s sidekick, The Mud. Read on for a few resources to help us weather the weather, whatever the weather, whether we like it or not! Once the snow begins to melt, it can be hard for parents to know what to pack in the child’s bag for transitional weather, especially since daily outdoor play in all weather is not something most people are used to. This letter, written by an early childhood teacher at City of Lakes Waldorf School, provides a good explanation of what gear children need each day to play robustly and enthusiastically. 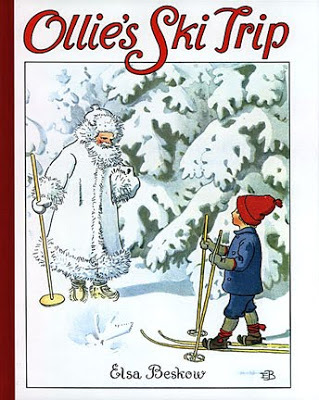 One of my favorite winter picture books is Ollie’s Ski Trip, written and illustrated a century ago by Elsa Beskow. In the story, Ollie receives his first pair of skis on his sixth birthday. When the first snow comes, he skis into the forest, where Jack Frost invites the boy to visit King Winter’s spectacular ice palace. Along the way, Ollie and Jack Frost encounter Mrs. Thaw. 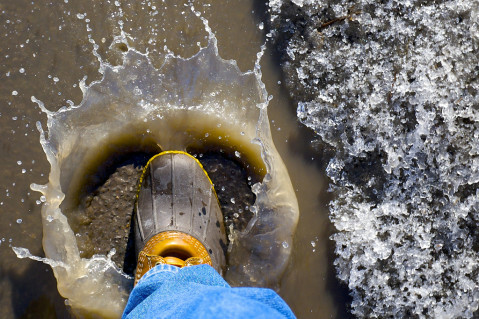 Her galoshes squelch with every step, she blows her nose and sneezes as if she has a terrible cold, and wherever she goes, she leaves behind a slushy, muddy mess. Jack Frost roars at her to go away (as a mom, I must admit I know the feeling!) Little Ollie, who has been taught to be respectful to adults, is horrified by Jack Frost’s rudeness. Jack Frost explains that Mrs. Thaw is Winter’s cleaning lady (a.k.a. “home care expert”). But she is terribly forgetful and always shows up too early. The only way to keep her from ruining a good winter is to scare her away. After Ollie returns from visiting the Winter King, he follows Jack Frost’s advice for the rest of the winter, calling, “Mrs. Thaw, Mrs. Thaw, Please don’t sweep our snow away!” each time he goes outside. 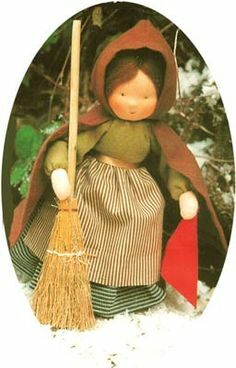 While King Winter is bold and stately, and Lady Spring is lovely, bright and flowery, Mrs. Thaw is a humble house-frau, busily sweeping away all that mud to make the place clean and bright. She is dependable, timely and hardworking. There is a lovely pattern and instructions for creating Mrs. Thaw in The Nature Corner, by M v Leeuwen and J Moeskops. Our next two-week intensive course Learning to Observe Children begins March 27th. Join us to learn the powerful art of observation, and a system for recording your observations that will help you bring this important practice to your daily work with children. Click here to learn more about earning 10 continuing education hours for this course. It has been really inspiring to share with so many others who are doing the same work with deep commitment. Others’ comments have really helped and supported me to feel that my questions are not only my questions, and have significant content and importance. I am very grateful and amazed that Mary and Cynthia have been able to field and respond to all of our comments. Thank you for pointing out that each child is a unique individual and not someone in need of fixing. Attitude means so much! Thank you for clarifying the difference between observation and assessment and for welcoming a more intuitive seeing and working. Thank you for bringing us together and creating this space and thank you to everyone who came and shared. I learned so much, remembered some things I’d forgotten and feel renewed and inspired.